Port Blair, Feb. 1: In a freewheeling chat with Andaman Chronicle, Mohan Halder, Pradhan, Tusonabad Panchayat said that there is a mafia working from Collinpur and Tirur areas who are involved in poaching and exploitation of the Jarawa tribe. "And the message is being disseminated that the settlers are not cooperating with the AAJVS. When there was a change in command of AAJVS in our area recently, it troubled the mafia as they were finding it difficult to continue with illegal activities inside the Jarawa Reserve. I am happy with the dedication of the present team of AAJVS posted at Tirur," Mohan told Andaman Chronicle. "Earlier, I did my best to put an end to the illegal activities being carried on by the mafia in the Jarawa Reserve. I had intimated the AAJVS about it, many times. Unfortunately no action was initiated by them. And the worst part; the information I passed to the AAJVS was being leaked to the mafia. They had a strong network, the mafia and the AAJVS," he said. Mohan said that Sujoy Mandal is the key person in the mafia, who is not from the village and nobody knows his whereabouts. "He stays in our area as a tenant but does not remain in one house for long. He keeps shifting houses. The Panchayat had even instructed the villagers not to provide shelter to him. But unfortunately it is that there are few who just go for money. 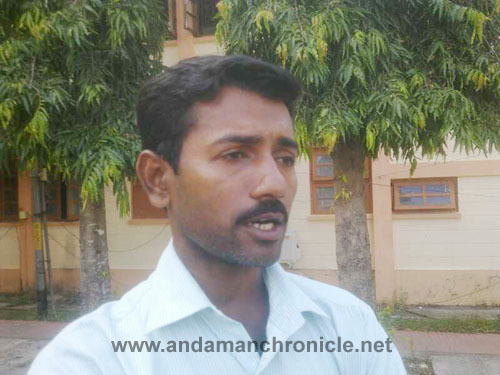 “The three who were held recently are not from our Panchayat. There is no proof to establish their resident status. I even doubt that they are in possession of any valid document to prove their domicile. They do have Election Identity Cards of West Bengal and I doubt whether it is original. I even doubt whether they are Indians”, he said. If they are Indians they should be in a position to disclose their Ration Card, School Certificate or any other valid proof of their citizenship. I have intimated about them to the Deputy Superintendent of Police that the three Ashit Mondal, Birbal Mondal and Nirmal Mondal do not belong to our Panchayat. They prefer to stay near the creek. They are the employees of one Rakesh Saha, who within no time has purchased four boats of his own. Rakesh has been working for a company, since the Buffer Zone case. The company runs resorts and Rakesh is well versed with the network," Mohan added. "There was a time when the Police had intercepted their boat but they were smart enough to throw the poached items into the crocodile infested waters. When I raised the issue, I was threatened by them," Mohan said. He further said that if the poachers do poultry, agriculture or any other legal business, he will provide them all assistance. He also felt that with time, youngsters of his areas will be influenced by these anti-social elements and they may pick this habit of poaching in the Jarawa Reserve to make quick money in a short time. Mohan also spoke clearly about the two poaching teams very active in the area. "There are two teams in the mafia and both the teams are headed by Rakesh Saha. The mafia, as I told you earlier has good connections with the govt. departments including few members of AAJVS and the Fisheries department. I doubt; the Fisheries Department by now would have issued them a fishing licence through back door," he complained. Mohan further added that he had told the DySP to check their domicile status. And he complained that even after that there has been no enquiry against them. "They might be Bangladeshis, I doubt. I do not recognize them by face. I just read their names in the newspaper. Moreover they do not come to the village during broad day light. They confine themselves to the house and carry on with their activities. I just get to know about them from the villagers," Mohan said. Mohan also informed that he had met the former DGP in this regard. "I had even suggested a solution to the Director General of Police last year. I drew a sketch of the area and marked vulnerable areas where poaching takes place. I had even suggested shifting of Police Outpost to those areas and I am confident, if the Outpost is established in these areas, 50% of the problem would be solved. This can be the first solution as the Outpost which has been shifted to the hill side is of no use. If the Outpost is shifted to the creek side, they can monitor and record all the boats moving out to the sea," Mohan suggested. "Secondly this is the place from where the Jarawa used to enter into the settlement area during low tides. But now since the creek has become crocodile infested, they cross the creek in boats of the settlers and poachers. This can also be checked," he added. "Thirdly, if Police boats are put on patrolling in this area, it could track and monitor all such activities. And lastly some young and energetic police officer should be posted, who can work actively and also guide his staff”. “It is high time to change the entire police team and implement my suggestions. I am really sad that because of the illegal activities of few outsiders, who even cannot prove their citizenship, the name of Collinpur Village is being tarnished," Mohan concluded.